Araminta Hiestand Chandler and her husband, Joseph Harrison Chandler, were living in this house, located a mile from Campbellsville on the Old Greensburg Road, during the Civil War. Joseph H. Chandler was an attorney, a strong Union Democrat, and a Kentucky State Representative. He often spoke at rallies in support of the Union cause. On July 4, he was scheduled to be on the program with U.S. Congressman Aaron Harding, who was due to speak on the Court House lawn at 1 o’clock. Plans were cancelled when Confederate Gen. John H. Morgan’s troops entered Campbellsville from the south following their loss at the Battle of Tebbs Bend at Green River. The Rebels fanned out to farms within five miles of the town to find forage for their horses and food for themselves. They came riding through Chandler’s fields knocking down the knee-high stalks of corn and tromping through the wheat. They robbed the corn crib, which was nearly empty from the work of former raiders. The cavalrymen were also hopeful that the servants in the Chandler household would cook their dinner. home alone with the children, was just as determined that she was NOT going to feed any raiders a meal that day. She stood at the back door of the house with a shotgun aimed at the Confederate intruders and warned them not to come inside her house. Not wishing to tempt fate, the cavalrymen obliged and left the household alone. "We went to the suburbs of the town of Campbellsville and camped in a lot. We had to carry our corn a quarter of a mile from a crib. Some of the boys went to the nearest houses and got something for their messes. I bummed a snack for myself. At dusk we were ordered to saddle up." Born in York County, Pennsylvania, Jacob Hiestand married Eve Landis in Botetourt County, Virginia in 1811. 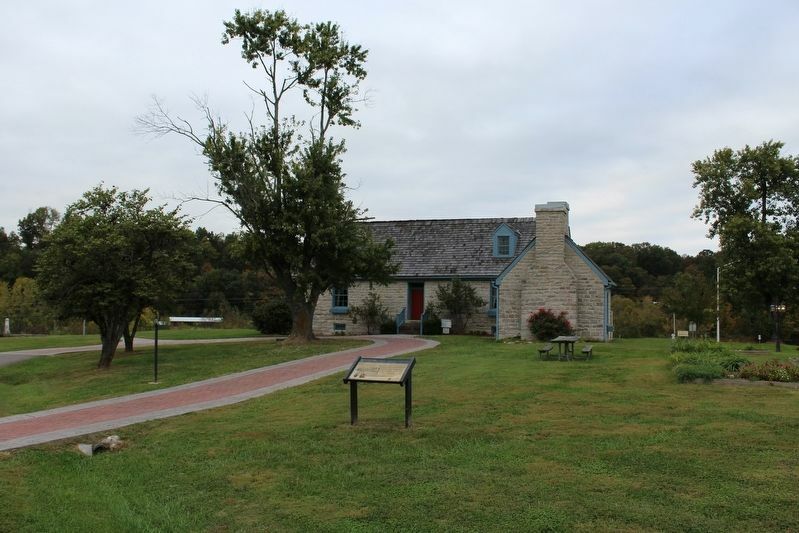 The couple lived in Highland County, Ohio and, around 1816, moved to Kentucky. Jacob operated a tannery in Campbellsville and became a Colonel in the 99th Kentucky Militia. 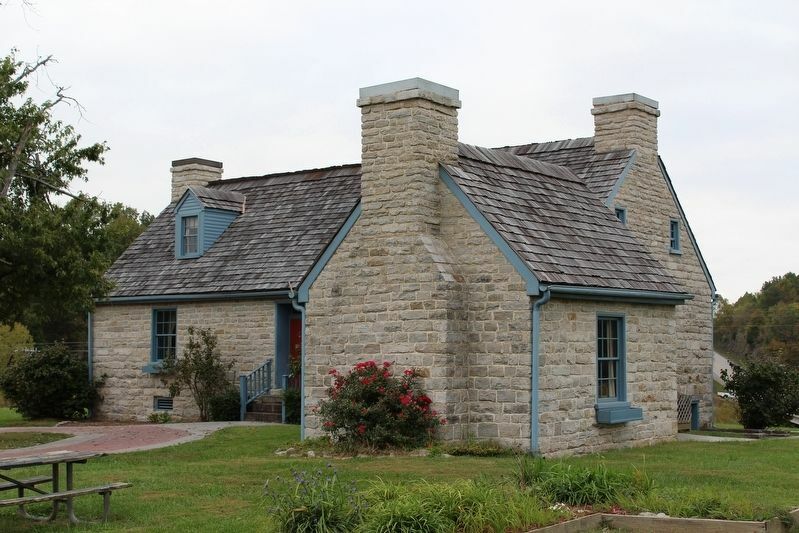 he build the stone house, sold the tanning business, and became a distiller and a large landowner. Daughter Araminta inherited the house in 1849. Erected by Kentucky Heartland Civil War Trails Commission. Marker series. This marker is included in the John Hunt Morgan Heritage Trail in Kentucky marker series. 37° 20.971′ N, 85° 22.516′ W. Marker is in Campbellsville, Kentucky, in Taylor County. Marker is on Campbellsville Bypass (Kentucky Route 210) north of Plantation Drive, on the left when traveling north. Touch for map. Marker is at or near this postal address: 1030 Campbellsville Bypass, Campbellsville KY 42718, United States of America. Touch for directions. Other nearby markers. At least 8 other markers are within 2 miles of this marker, measured as the crow flies. Campbell Memorial (approx. 1.7 miles away); Brig. Gen. Elias Barbee (approx. 1.7 miles away); Campbellsville / Taylor County (approx. 1.7 miles away); Cumberland Trace (approx. 1.7 miles away); Confederate Raids (approx. 1.7 miles away); Courthouse Burned (approx. 1.7 miles away); First Taylor County Courthouse (approx. 1.7 miles away); Second Taylor County Courthouse - 1867 (approx. 1.7 miles away). Touch for a list and map of all markers in Campbellsville. More. 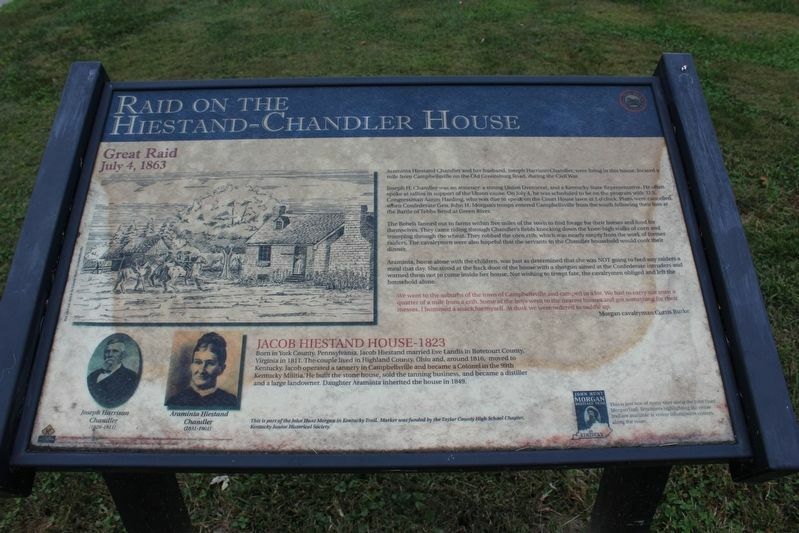 Search the internet for Raid on the Hiestand-Chandler House. Credits. This page was last revised on November 2, 2016. This page originally submitted on November 1, 2016, by Tom Bosse of Jefferson City, Tennessee. This page has been viewed 229 times since then and 8 times this year. Photos: 1, 2, 3. submitted on November 1, 2016, by Tom Bosse of Jefferson City, Tennessee. • Bernard Fisher was the editor who published this page.